Why are transmission gratings less angle sensitive than reflection gratings? Anyone who has tried to align both transmission gratings and reflection gratings will have experienced that the transmission grating is much easier to align. But, what are the physics behind this? One would think that the diffracted orders of both types of gratings are determined by the same grating equation so, why is there still a difference? This technical note explains the reason for the difference in angular alignment tolerance between transmission and reflection gratings. The main difference can be seen on the figures above. In the following, all angles are measured relative to the normal of the grating. First we will consider the 0th order diffraction order for both types of gratings while tilting the grating slightly. For the 0th order diffraction the diffraction angle (β) equals the angle of incidence (α). For a reflective grating, the 0th order is obviously reflected back from the surface just as if the grating was a plane mirror so, when the grating is tilted the 0th order diffraction shifts by twice the angular tilt. The higher order diffractions basically follow the 0th order diffraction so, the mth order diffraction also shifts angularly by twice the tilt angle of the grating. For a transmission grating however, the 0th order goes straight through the grating and is not affected by tilting the grating. Again, since the higher order diffractions follow the 0th order diffraction, the mth order diffraction is almost unaffected by tilting the grating. 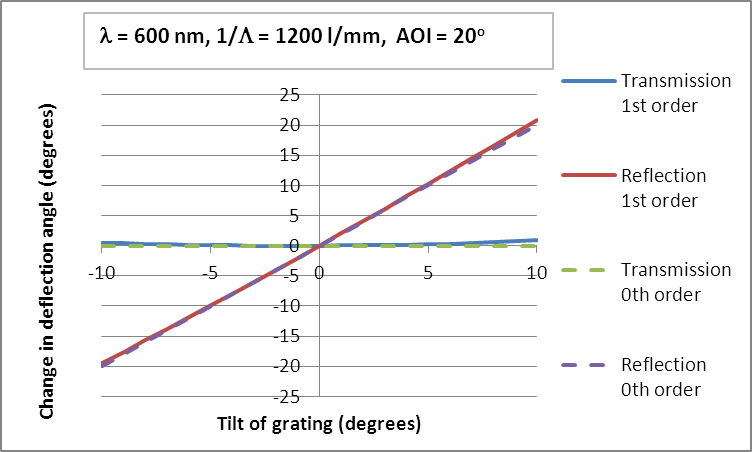 Figure 1 compares the total change in 1st order deflection angle for a transmission and reflection grating compared to the change of the 0th order for a typical grating groove density of 1200 l/mm. The plots in Figure 1 were calculated by the grating equation (see next Section for details). Change of deflection angle for 0th and 1st order as a function of grating tilt for a transmission grating and reflection with grating 1200 l/mm. where m is the diffraction order (0, -1, +1, -2, +2, etc.). We will use Figure 2 in order to find the relation between the diffraction angle β’’ as a function of tilt angle θ. β’’ is measured from the non-tilted grating normal. Angles on the left side of the grating are positive when measured counterclockwise. For the transmission grating the angles of transmitted orders are positive below the grating normal. These equations were used to calculate the deflection change β’’-β in Figure 2.